Not all of Philadelphia has Phillies Phever. 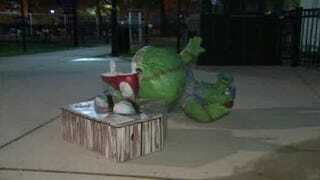 Two men were arrested for assaulting a 6-foot, 100-lb sculpture of the Phanatic. His prehensile tongue offered pathetically little defense. Two homeless men were arrested and charged with criminal mischief, disorderly conduct, and attempted furry fish-bird murder. The damage is estimated at $3,000, but the emotional scars? Well, they'll last a lifetime. Okey dokes. Rest up, back tomorrow.